[CLOSED] Euro Jackpot contest #21 - DOUBLE CHANCES EDITION - win up to 32 SBI and receive a part of the @steem-bounty!!! You can win 1 to 32 SBI. But be quick - there are some limitations. @exator won one SBI as the special edition winner. What is the DOUBLE CHANCES EDITION about? Actually, it's easy: I bought two tickets today and you can make two entries. I would appreciate if you do that in one comment. It is just as if we do two contests in one week. The rules are the same for each ticket/entry. Look at it as if these are two post. Why two tickets this week? Because yesterday I had three participants who came up with suggestions for this week's number. @takowi came up with "03 - 06 - 09 - 12 - 15" and only some minutes later @exator came up with "04 - 13 - 27 - 33 - 42". Also @samsemilia7 made a suggestion about an hour later. I noted these for next week already. SBI stands for @steembasicincome and if you own one or more SBI you will receive a vote for every future post you will write ... for a lifetime. You can read everything about @steembasicincome in their posts. Just send 1 STEEM to @steembasicincome. Include the name of a Steemian to sponsor in the transaction memo (preceded by @). You and the person you sponsor will each receive 1 share in the program. You can sponsor any active Steemian, it does not have to be a current member. The official currency for enrollment is STEEM. We are not currently accepting SBD. Please allow up to 7 days for your enrollment to be processed. 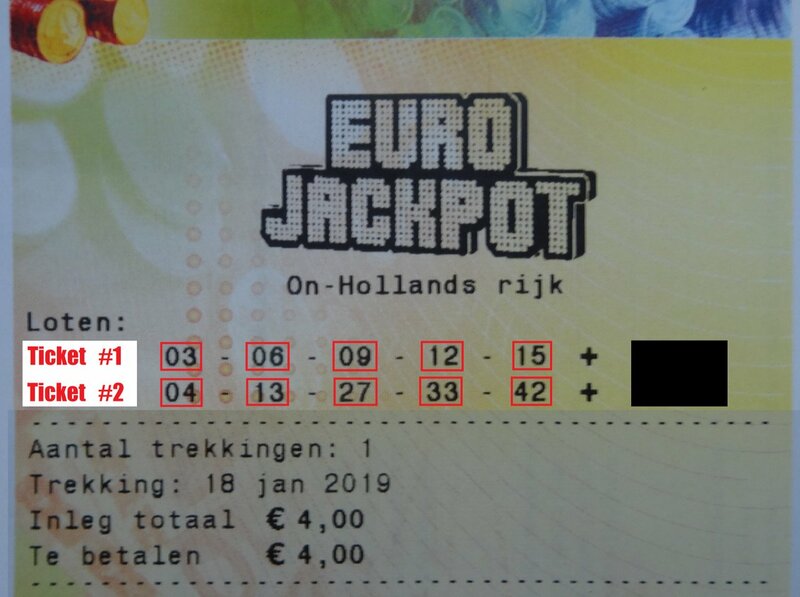 It's simple: Saturday's I will buy a ticket for the Euro Jackpot and will post a photo of the ticket I bought here on steemit. You will see the 5 main numbers I'm playing with. This week @takowi and @exator chose the (hopefully) winning numbers. Resteem is not mandatory but highly appreciated and gets you more of the @steem-bounty. If you choose 1 of the numbers of my ticket plus additionally one that is not and one of them is drawn the next Friday you will win 1 SBI. If both are drawn feel happy and read 2. Limitation: the first 5 correct entries with one correct number will win 1 SBI each. If you choose 2 of the numbers on my ticket plus additionally one that is not and two of the three are drawn the next Friday you will win 2 SBI. If two or more of your three numbers are not drawn you'll win nothing! If all three are drawn feel happy and read 3. Limitation: the first 3 correct entries will win 2 SBI each. If you choose 3 of the numbers on my ticket plus additionally one that is not and three of the four drawn the next Friday you will win 4 SBI. If two or more of your chosen numbers are not drawn you'll win nothing! If all four are drawn feel happy and read 4. Limitation: the first 3 correct entries will win 4 SBI each. If you choose 4 of the numbers on my ticket plus additionally one that is not and four of the five are drawn the next Friday you will win 12 SBI. If two or more of your chosen numbers are not drawn you'll win nothing! If all five are drawn feel happy and read 5. Limitation: the first 3 correct entries will win 12 SBI each. If you choose all 5 numbers on my ticket plus additionally one that is not and five of the six are drawn the next Friday you will win 32 SBI. If two or more of your chosen numbers are not drawn you'll win nothing! Limitation: the first 10 correct entries will win 32 SBI each. Do not forget one number between 1 - 50 that is not on my ticket as your personal bonus number. If you are just as confused about time zones as I am, check on worldtimebuddy. Comments made after Friday 18th of January 2019 at 7 PM CET (6 PM UTC) will not participate in the contest. Do not forget to add a number between 1 - 50 that is not on my ticket to your choice! If you love dogs you might want to take a look at @dog-marley's stories. If you love music you might want to take a look at @psionic-tremors' blog.